Happy New Years' Eve! Happy Seventh Day of Christmas! 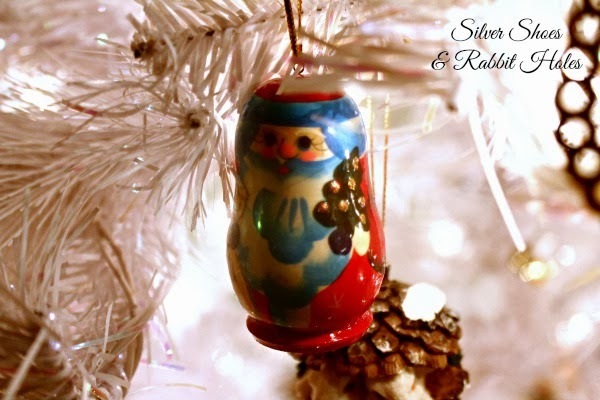 I could give you all a glorious look back at 2013 here at Silver Shoes & Rabbit Holes, but I never even wrote a proper Christmas Day post. Why? I was too tired. Why? Because my precious monsters daughters decided to secretly set their alarm for THREE AM that day. Big Sis tells me they checked out all their Santa presents, then turned the radio on and danced to Christmas music for a while. Big Sis got a start on a potholder with her new metal loom. At some point, they watched Despicable Me 2. Once in a while, they came into our bedroom to keep us updated. Finally, someone crept in next to my very sleepy head and shook a box of macaroni and cheese next to my ear. "Mommy, can we have macaroni for breakfast?" "Huh? Well..." I remember looking at the clock and exclaiming, "No! I'm not making mac and cheese at five o'clock in the morning! Go back to bed! Give Mommy and Daddy another hour or two." Then the kiddo went to Mr. B's side of the bed. He woke up and said, "Well, what the hey, it's Christmas." He says he got up, made the macaroni and cheese, then as he brought it to them, he noticed it was still completely dark outside. I slept a couple more hours, but I was pretty bleary-eyed all day. Mr. B and Big Sis took naps, but Little Sis was gung-ho for playing, and I needed to make lasagna for Christmas dinner. (By the way, much love and appreciation for the Walgreen's employees who had to work on Christmas Day. Mr. B had to make five or six trips, because we kept finding things we'd forgotten or ran out of. It was just that kind of day.) However, by the time family arrived - my dad, my grandma, and my sister, her husband, and her daughters - I had two lasagnas, a salad, and a gingerbread loaf ready to go. We ate, we opened presents, and we sang "Happy Birthday" to my grandma, a Christmas baby. 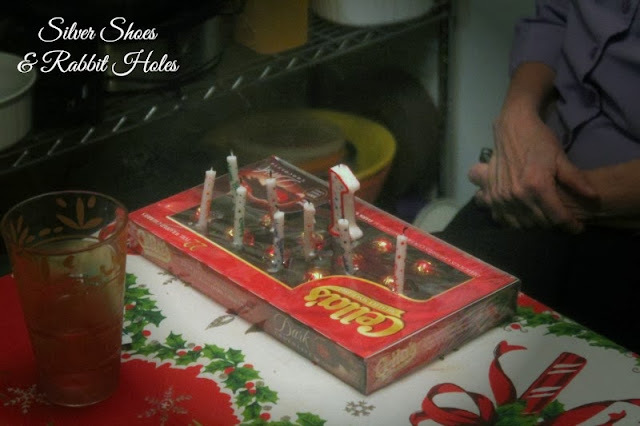 My dad got her a most unusual cake this year: a box of cherry cordials with candles poked through the plastic. 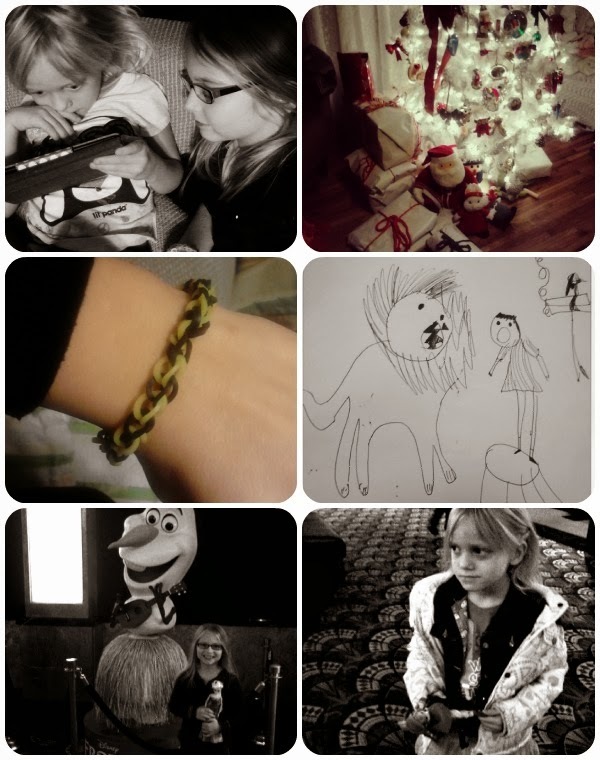 This was a very, very casual Christmas. Big Sis has promised me that next year, they won't get up until at least seven. She actually felt bad that Mom and Dad missed seeing them find their Santa presents. 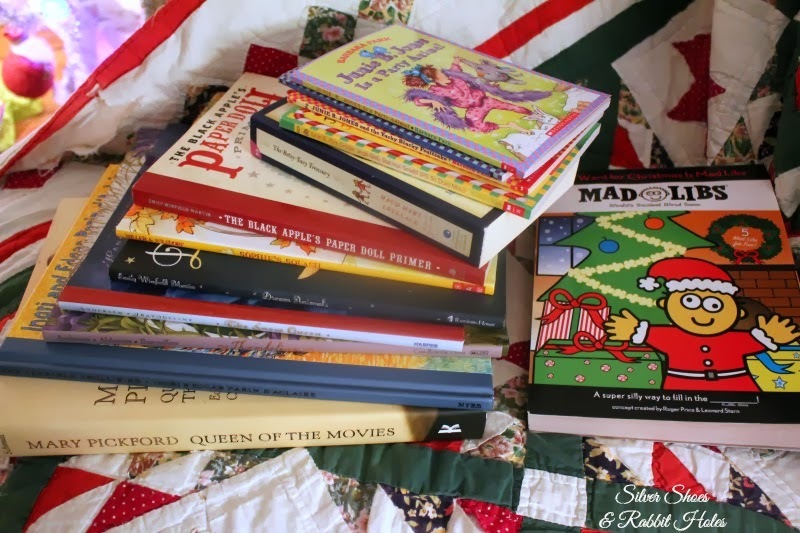 Above are the books Big Sis received for Christmas. Mr. B and I got her The Betsy-Tacy Treasury. 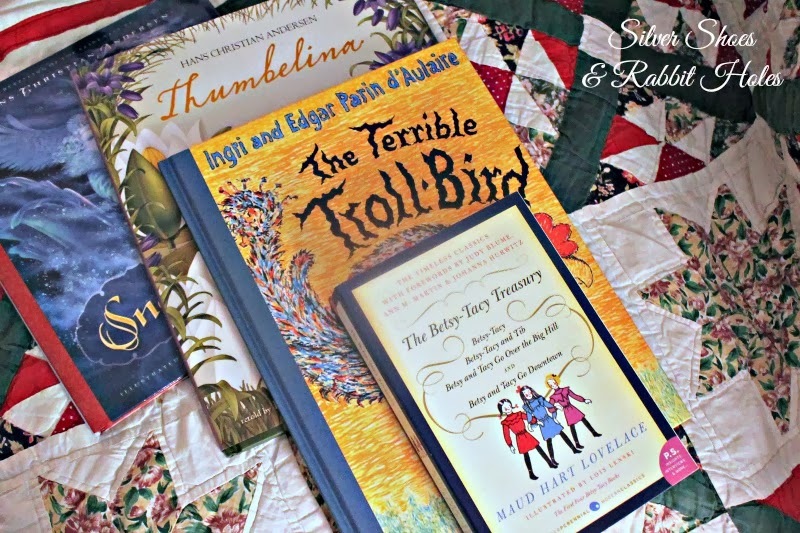 My dad got her The Snow Queen, Thumbelina, and The Terrible Troll-Bird. 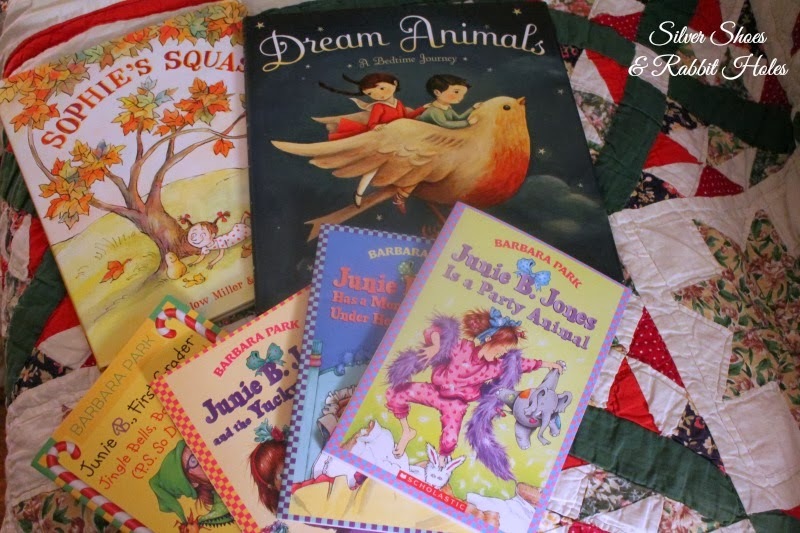 Little Sis received a set of Junie B. Jones books from the parents (thank you, Scholastic order form! ), along with her own copy of Sophie's Squash. My dad got her Dream Animals by Emily Winfield Martin (swoon). My dad got me an Emily Winfield Martin book, too! He also got me this glorious Mary Pickford coffee table book. Big Sis was as excited about that one as she was her own presents. Since Christmas Eve, we've been treated to visits from two of my friends who have moved to New York, my mom, stepdad, and brother from Oklahoma, and we babysat Little Sis's best friend and her brother for a day. My friend Amy brought the girls ornaments from the Russian store near her office building in New York. We have't begun a big clean-up or purge yet. I'm trying to relax and just try to enjoy Christmas and the fact the girls are home. It's hard. I did have to devote all of Saturday to the massive piles of laundry. My external hard drive is still "at the doctor's," and the first attempt to recover all my data, years of pictures, music, and video files, was unsuccessful. Whiny whine whine. But the good things: Little Sis is thrilled to lie around the house, watching TV and making art as much as possible. Big Sis and I have become loom bracelet-making fools. Yesterday, we shook off the world and went to see Frozen again. Mr. B got to see it with us this time. He loved it, too! Happy New Years' Eve! Hope 2013 was good to you. See you next year! Oooh I have the Black Apple's Paperdolls book too! Awesome stuff! I want to buy the Dream Animals next! 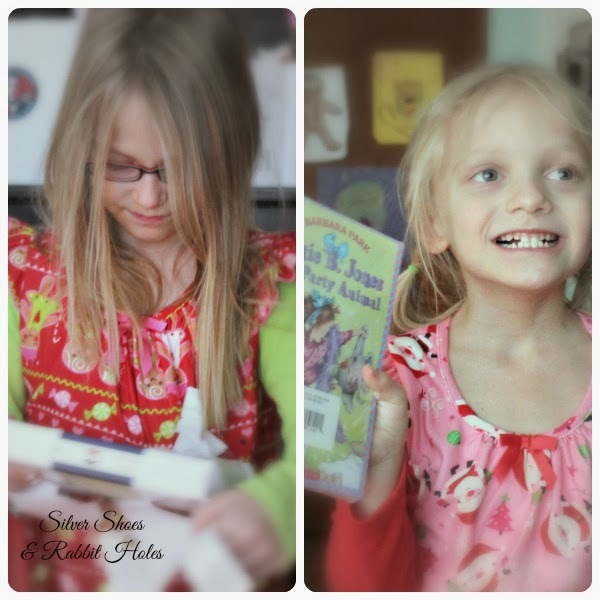 Your Christmas morning story made me laugh because I can so relate. Why is it that my boy can't wake up for school but is super duper alert ta 6am during the holidays? Have a happy New Year Danzel! I have Oddfellow's Orphanage, and I've planned on buying Dream Animals since it came out, but I knew it would be best to wait until Christmas. 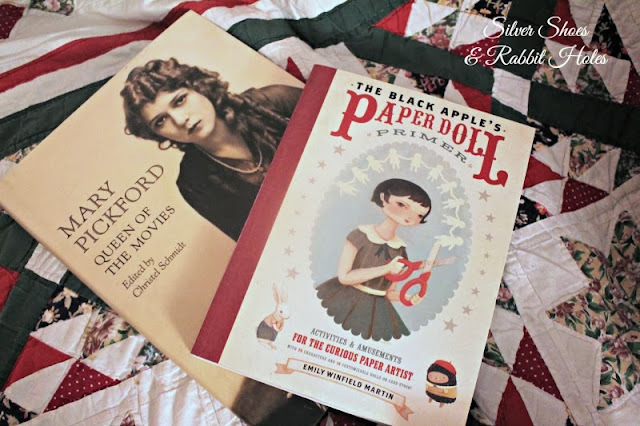 I've had the paperdoll book on my wish list for forever. I'm wondering if I shouldn't get a second copy, one to tear up and one to keep whole. Is that strange? AND YES!!!!! I cannot drag Little Sis out of bed before 8 AM, and even then, she whines and gripes at me, but THREE????? UGH!!!!!! I like that idea, too! Thank you, and Happy New Year to you, too!! Honestly, your daughter is pretty GOOD at art! The lion... Jeez, it's wonderful! I was thinking about it this morning (leaving home, catching the bus) and said to myself that in the evening I must write it to you :) Happy New Year! She has been my little artist from the time she could hold a crayon! When she was as young as two, if she got upset about something, we would ask her if she needed to draw something. She would angrily nod her head yes. She has her own style. ;) This one is definitely one of my recent favorites. I passed on your comments. Shy to the end, she sort of nodded and went back to playing. I believe she was flattered, so on her behalf, I thank you! Happy, happy new year to you, too!